Any self-respecting handyman must have their own reliable tools in case the need arises. After all, what good would knowing how to repair something be, if you do not have the proper tools to do the job? The right instruments mean that you have the capability to repair items without receiving any additional expenses. In fact, having a decent quality set of tools can save you thousands from repairs or replacements annually. The Metaltech ScaffoldBench System is an amazingly built multipurpose tool for every home or workspace. It has four distinct variations meant for specific tasks. Anyone can transform the ScaffoldBench into any of the four modes by simply reconfiguring the structure. All you need is the instructions, which are simple enough to follow. As you can see, the Metaltech ScaffoldBench offers four unique transformations. It can turn into a scaffolding, saw stand, storage rack, and a utility cart. In addition, each form has their own specific use – depending on what you need. All you have to do is to rearrange the pieces like a puzzle. For the majority of the time, you will probably be using the ScaffoldBench in its Storage Rack form. It offers two levels, each with a large amount of space to hold all your items. The wheels at the bottom of the rack also make it more mobile than your average storage locations. This also means that there is a partition between the bottom layer and the floor, giving you extra storage space. The rails on either side also function as rests to hook items on, providing even more additional space. To improve mobility while retaining the storage capacity, you can transform it into its Utility Cart mode. This still provides you with two levels of space, while being easier to push around. Mobility is still there – same as the storage rack. The utility cart mode however offers a lower center of gravity, making the items stored more stable while in transit. Comparing the two similar forms, the Storage Rack provides better stability in longer periods. The Utility Cart on the other hand is a perfect place for storing items that require mobility. Both however can carry a great deal of weight for long periods of time. The remaining two functions of the Metaltech ScaffoldBench System offer a more targeted approach. Its Miter Saw Stand is perfect for woodworking, where it provides an excellent height for saws. 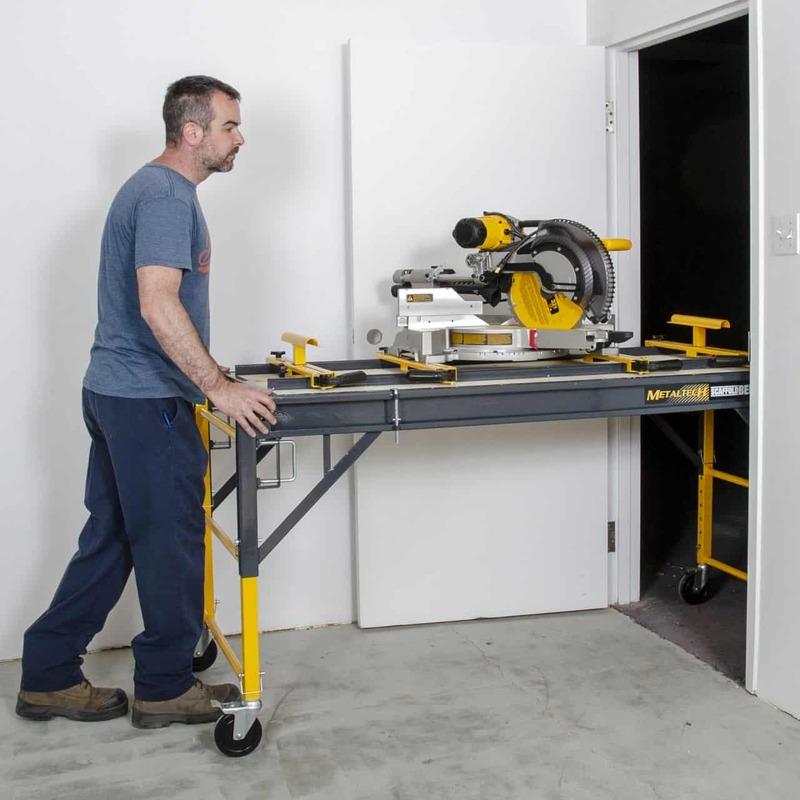 It can also flip, turning the saw stand into a standard table to work on. The Baker Scaffold mode is a very stable platform one can use when needing elevation. The scaffold can rise to up to six feet (giving you a reach of up to twelve feet up). All while retaining its strength and balance. It can hold up to 1,100 pounds of weight at maximum heights. It is strong enough to hold up to two workers at a time. This, of course, includes any tools or items you may need while up there.